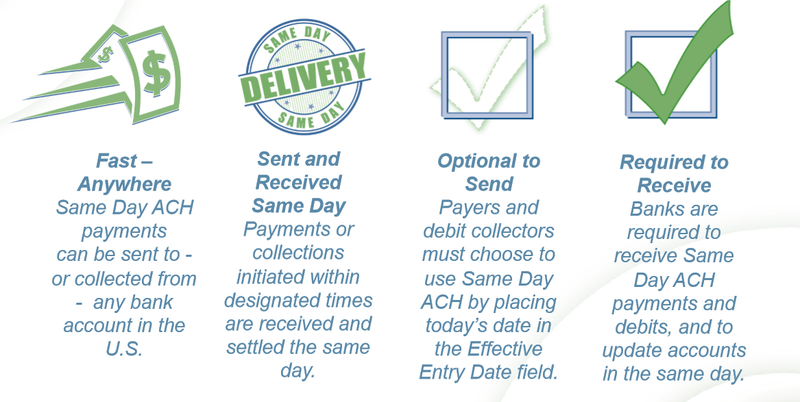 Are you ready for Same day ACH bank to bank transfers ? NACHA after a long wait has introduced Same-day ACH bank to bank transfers. Companies accepting payments through ACH extensively can get paid within a day now instead of having to wait upto 5 days. What does it mean for your business ? Businesses which receives large payments ( more than 10,000 USD ) can now breathe a sigh as of relief as they would have access to funds their customer had transferred faster than ever before. Accepting ACH payments through Quickbooks ACH, Stripe, Authorise.net etc has the downside that it takes up to 5 days for the payments to settle. By using a direct ACH connection with your bank, Your business can ensure that your funds settle faster! Previously if you were settling transaction directly with your bank , Your payments would settle through the classic ACH route.Such transactions would take upto 1-2 days to settle. In the diagram above you can see that if the transaction information reaches the bank before 4 pm , The transactions will be settled by the 5.30 pm settlement window in the same day in case of Same Day ACH ! Why Should You switch to same day bank to bank service? One of the advantages of accepting credit card payment was that the settlement happens instantly ,but this convinience came at a huge cost of high interchange fee(2% – 3% of the transaction cost ). With same day ACH bank to bank payment service you will be able to get payments settled within the day and with almost nil interchange fee (close to 50 cents for one transaction). For B2B payment transactions Same day Ach is the best thing that could happen! Customer Service: predictable timing for disbursements/payouts saves costs for payment receiver Low cost, ubiquitous option to expedite payments and can reach any bank account in the U.S.
Reconciliation becomes easier: As the return information(whether the transaction was rejected by the network) and settlement information (whether the money has reached your account) is received faster the reconciliation will become easier. Please do check with your account manager at the bank to understand the costs involved.